Have you ever heard of human edited directories ? Curlie.org maybe ? What about Dmoz ? Chances are good that if you’ve ever looked into how to get your blog or website out there for the world to see, you’ve probably stumbled across a website directory like Alltop, Best of the Web or even the lesser known but well trafficked Ezilon or other human edited directory.. and particularly several years ago there was the top dog.. Dmoz. Dmoz was held as “the place to be” if you wanted to get a powerful link online. It was a highly sought after directory link. Even today (e.g. 2017) though the official DMOZ website is dead (closed by AOL, a couple mirrors still exist for it though) .. searches for Dmoz still yield nearly 4500 searches a month ! Nowadays, there is speculation as to the power and necessity of these kinds of links, but what I can tell you is that I wouldn’t turn my head away from links like this. Now I don’t want you thinking this post is simply an overview about going after directory links, but moreso to understand that this post is about “one directory link”. The successor of Dmoz..
Did you even know that there was a successor to it in the first place ? A cute little name, but if it’s anything like what Dmoz used to be.. this is going to be a blog and website directory to be reckoned with I assure you. It’s still in development but the doors are going to open in the near future and when they do.. oh man.. I can only imagine that the best is yet to come. So let’s have a look at this new web directory. As you can see in the image there are a couple of links. Both links are specifically for the editors. Interestingly enough there is a forum designated primarily for editors and then the login link is another link that appears to be associated with the editor forum as well. At this time, I can’t differentiate between the two links because I do not have access, but if a Curlie moderator comes across this post, maybe they’ll be able to provide some insight for us all that are wondering just what kind of additional features and access the editors have in this section too. For all I know at this point, it’s still under development but that’s pure speculation on my part. Aside from that, the reminder of the front page is pretty standard as far as what you’d expect to see upon visiting a directory page. Note: additional sub categories do exist but have been listed here in this post. Below the categories, Curlie also lists the number of current editors, categories, sites and languages. Believe it or not there is a way to keep up with what’s going on with Curlie. The easiest way to do that is via the forum. Now you may be thinking… wait a minute.. didn’t you mention forums earlier and wasn’t that just for the editors ? You’d be right and I did, but there is indeed a forum for everyone else and it’s called their Resource Zone. You can access to the resource zone here: http://www.resource-zone.com and once you’re there you’ll be greeted with this page. 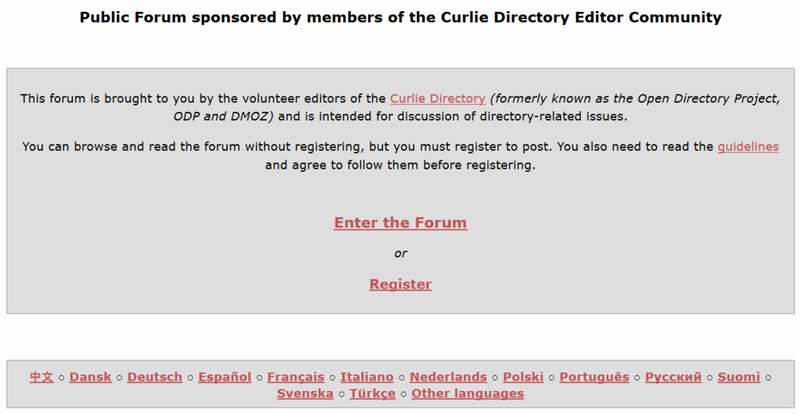 Once you’ve registered with Curlie’s resource zone, you’ll be able to participate in discussions and post to the forum. At the time of this post, the suggest a site section was newly added and it’s there just to be there for now because they haven’t really provided guidelines in this section for suggesting a site. So in all reality you can’t suggest a site yet, but guidelines to do will be released in the future, however it’s still a thread to watch. The same would apply to the “becoming an editor” thread. Currently they are not accepting new applications but they are processing the applications that were received when the window was open to apply and are processing the reinstatement applications that they received too. I’ve been keeping an eye on Curlie for months and they have been making steady progress to opening the doors. Directories are still a big deal even though there are plenty of people that argue for them and large followings that say don’t worry about them too. Quality links are all that matter and that’s why Curlie is so important. It can’t be stressed enough that this is the successor DMOZ.. arguably the most successful human edited directory in the existence of the internet. Remember, as I mentioned before that the directory doesn’t even exist anymore and it still receives nearly 4500 unique searches per month. With that said, it makes it hard not to make a case that leans towards directories being a thing of the past and not relevant to today’s world of SEO and for a blog or websites traffic and online presence. A hard cold reality is that people still believe in submitting a link to a quality directory and Curlie is going to be the new big deal in directories “very soon”. We may genuinely miss DMOZ, but I have a feeling we’re going to fall in love with Curlie.